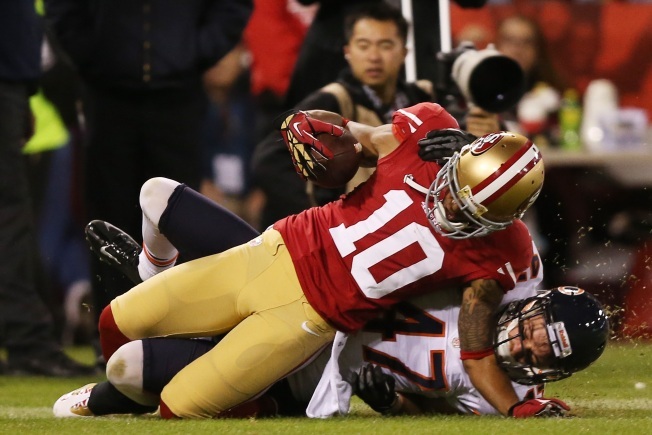 Going into 2012, 49ers wide receiver Kyle Williams was trying to shake off the costly mistakes he’d made as a punt returner in the NFC Championship Game the previous season. Now, he’s hoping to shake off the rust and doubts from a knee injury that ended his 2012 season in Week 12. Williams, entering his fourth NFL season, all with the 49ers, hasn’t yet been cleared to participate in full organized team activities (OTAs) that began two weeks ago. But he has been continuing to rehab the knee and is running routes during individual drills, according to 49ers.com. Williams is confident he’ll be at full speed for the start of Niners training camp in July. And, with the injury to No. 1 wide receiver Michael Crabtree, San Francisco will need its remaining wide receivers to raise their games. Over his three previous seasons with the team, the former Arizona State standout has played a complementary role as a fourth or fifth wideout, punt and kick returner and special teams contributor. In 11 games last season he caught 14 passes for 212 yards and a TD. His best season came in 2011 when he had 20 receptions for 241 yards and three scores. At 5-foot-10 and 186 pounds, Williams can give the 49ers a receiving option with good quickness and speed. Before Crabtree’s injury, Williams likely was on the bubble for making the team. His chances now are better if he’s back to full speed. The team is hoping both Williams and Mario Manningham – whose season also was cut short by injury – will be fully healthy in July and August to show they can be key contributors to the passing game in 2013. But Williams knows he can’t rush things. He has to be smart – even though he’s eager to fully participate. Williams, Manningham and Anquan Boldin are among the experienced veterans in the receiving corps; the 49ers will also need contributions from less-experienced vets and rookies such as A.J. Jenkins, Ricardo Lockette and Quinton Patton. Williams says he’s already trying to help the younger players get better. Before he was injured, Williams had shown good on-field rapport with quarterback Colin Kaepernick. If he picks up where he left off in the upcoming training camp, he’s likely in a very good position to make the roster again. “I feel good, feel great, making progress every single day and we just want to stay on that same path and be ready for week one,” he said.